Happy New Year beauties! I decided to start the New Year with an even shorter hair cut and I couldn't be happier. I feel like a weight has literally been lifted off my shoulders and I can't wait to rock some new looks with my new do. 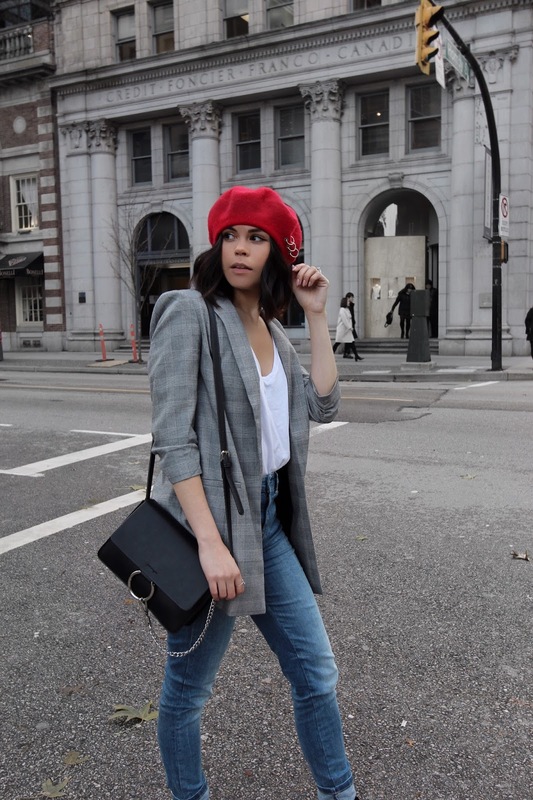 I'm always looking for new ways to re-create and liven up my business-casual looks as I spend majority of my days in an office or in meetings. A mix of of professionalism and comfortability is key when putting together the ultimate weekday look. Read on for 4 must-have items for creating the perfect business casual look for 2018! 1. Checkered Blazer. This checked blazer from Le Chateau is the newest must-have pattern to incorporate into your working wardrobe. The classic pattern can be paired with your favourite pair of jeans or with an identically patterned pair of pants. 2. Boyfriend tee. This wardrobe-staple can be tucked into a pair of tailored work pants, a pencil skirt or a sleek pair of denim to create the ultimate business-casual outfit. 3. Functional and fun booties. Why go for typical when there are so many fun options of booties out there. A classic black pair is expected, but an ornate pair will add a kick to your ensemble (pun intended!). Don't forget to find a functional height to keep you light on your toes all day long. Try this fun yet functional pair! 4. A small and chic bag. Sometimes I make the mistake of carrying the largest tote filled with unnecessary items. Not only is it super uncomfortable to carry, it adds an inconvenient weight that I just don't need when going from one meeting to the next. Keep your work day essentials in a more convenient-sized bag and re-evaluate when you need to be carrying with you on daily basis. This post was brought to you by Le Chateau. All thoughts and opinions are my own. Hey Rina! Looking so ready for business! I love your cute booties and of course the blazer, which adds that serious business flare. Great post! Working in marketing, this is basically how I have to dress everyday, and it can be quite difficult! Awesome tips! Love this look SOOOO much! 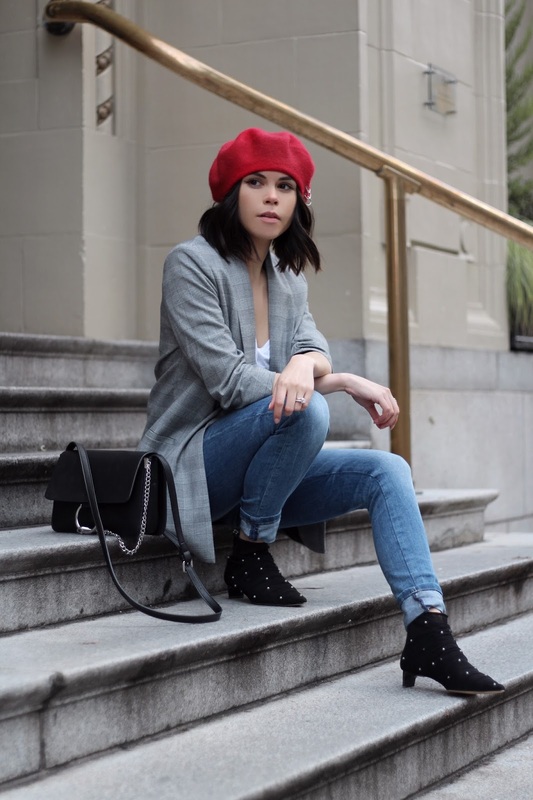 That beret is so gossip girl and it looks perfect on you. I would love this as a business casual outfit.